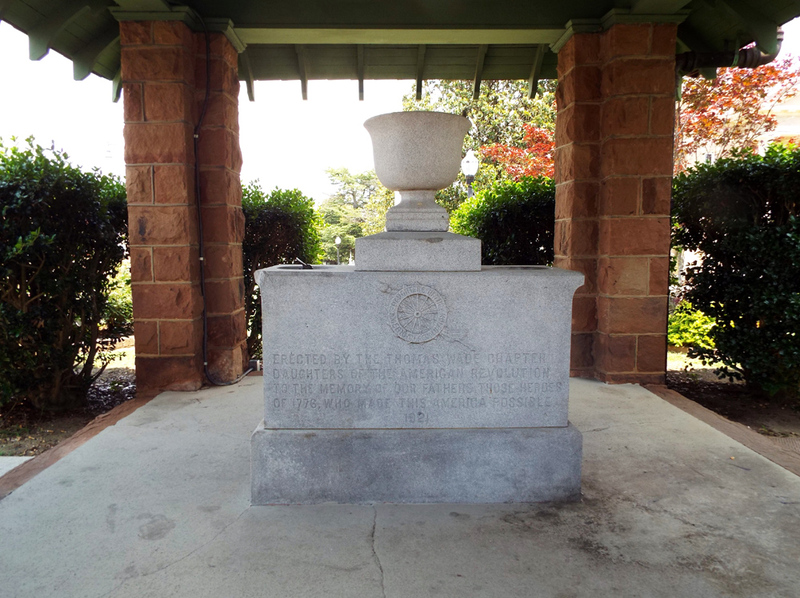 The memorial is a public drinking fountain dedicated to citizens of Anson County who died in World War One and to the heroes of the American Revolution. The fountain’s rectangular base is approximately fifty inches long by twenty five inches wide and twelve inches high. The larger middle part is approximately forty-seven inches long by twenty-two inches wide and twenty-four inches high. Atop there is a carved chalice with a nineteen inch by nineteen inch base and twenty-four inches tall. Two bowls carved into the middle part once held two fountain bubbler heads, probably one was for whites and one for blacks, but no indication of that remains. One brass bubbler head remains in place but the fountain is inoperative. The fountain sets perpendicular to North Green Street with inscriptions on both sides. Above the inscription on the south side is a carved Daughters of the American Revolution logo. The fountain is under the D.A.R. Memorial Pergola. The columns supporting the pagoda style roof are made of brown stone. The same stone lines a low wall that surrounds the garden area in which the fountain and pergola are located. South: ERECTED IN HONOR OF ANSON COUNTY SOLDIERS / WHO SERVED IN THE WORLD WAR TO PRESERVE / THE PRINCIPALS AND IDEALS OF AMERICAN / INDEPENDENCE AND TO VOUCHSAFE TO SUCCEEDING / GENERATION THE SUBLIME TRUTH AND THE SACRED / TRUTH OF LIBERTY, EQUALITY AND JUSTICE. Several thousand people attended the late afternoon unveiling of the memorial drinking fountain. The featured speakers were Tom Byrd of Asheville, State Commander of the American Legion and Colonel Hanford MacNider, National Commander of the American Legion. Having spent the early part of the day at memorial ceremonies in Charlotte, the speakers were met at the edge of town and escorted to the podium by about 100 ex-service men. During a brief speech, MacNider stated that the “real patriotism of the country is in the rural districts rather than in the more congested centers of population.” The Camp Bragg (now Ft. Bragg) band provided music and the base also provided two pieces of artillery for a 21 gun salute. “Areoplanes” from Camp Bragg were also scheduled to circle overhead during the afternoon. A baseball game, tennis tournament and boxing matches rounded out the day which ended with a barbecue dinner served to all World War One soldiers. Other notables included Lieutenant Hoyt P. Taylor, local Legion post commander, and Reverend W.R. Shelton, a former service man and post chaplain, who gave the invocation. T.C. Coxe, Mrs. Frank Bennett and T.L. Caudie made welcome addresses. Mrs. W.O. Spencer of Winston Salem, State Regent, D.A.R., accepted the fountain on behalf of the Daughters. 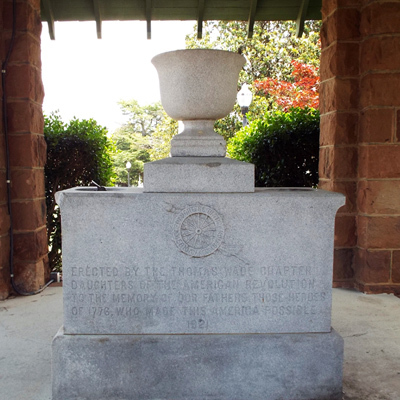 The fountain is located at the corner of N. Green St. and E. Wade St. to the right of the Anson County Courthouse. Multiple memorials are associated with the Courthouse area. The Confederate Monument sits in front of the entrance to the building and the Confederate Women Monument is on the left. Two bronze plaques are mounted to exterior walls of the Courthouse. One lists African American soldiers and its companion white men and women who served during the Great War. The memorial is surrounded by trees and bushes. Landscaped walking paths lead visitors to the memorial.